That means it’s more important than ever to get yourself into that conversation and create content that your users want to engage with. By marketing with content you can reach potential customers while they are forming those critical opinions early in the sales cycle. This method is a great way to start investing slowly and methodically focusing on the kind of material that will drive conversions. Okcupid’s 23 post blog has over 4000 linking root domains. Salon.com saw a 40% increase in traffic by posting 33% fewer posts. That’s on over 7 million unique visitors. To do this you need to be able to validate that what you are doing is productive. In fact being able to validate what you are doing is driving you forward is significantly more important than how much you do. The goal here is show that your content does in fact drive conversions for your business. Remember how we define success? Put traffic and conversions aside for the moment we are trying to concretely validate the process. Step One: Create a squeeze page to collect email addresses offering the most cohesive vision for what your content should accomplish. 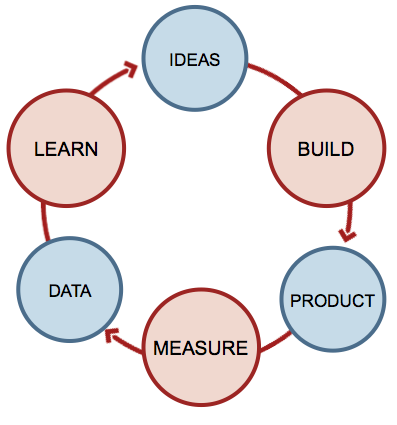 This should be a streamlined concept for example a startup newsletter I’ve been reading did this well. 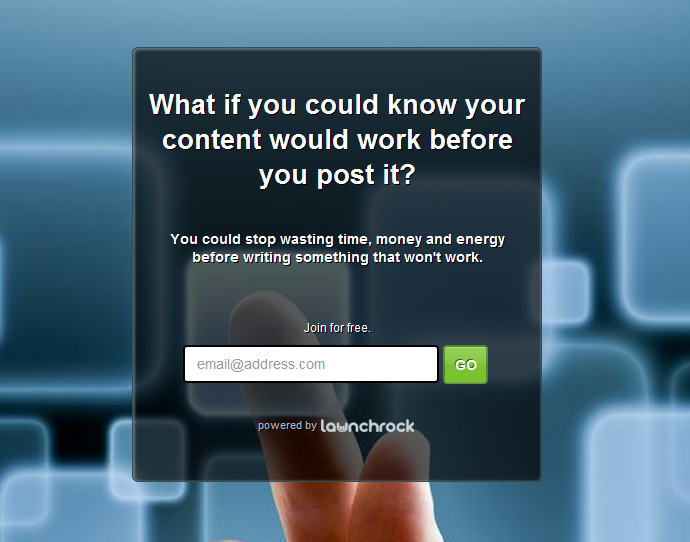 LaunchRock is a great tool to get this started immediately handling the email signups and analytics for you. Building this page took me all of 5 minutes. For a more involved page use a successful squeeze page like Code Year to model how your build yours. StumbleUpon paid discovery is a particularly effective method for these types of pages. It can be unreliable traffic but 500 users for $50 is nothing to sneeze at, strongly consider the $0.25 per user option. YouTube promoted videos are a bit of a tangent but it’s another great medium to run these tests. The last time I ran a campaign the video I was promoting got 60,000 views on a $2,000 budget over a two month period. That’s three cents per video view and by far the most attention you get per dollar spent. Share it on a relevant subreddit, Hackernews, Facebook and Twitter. Email people who have an interest in the topic. You already have your one sentence pitch so JFDI and find a way to get people to it. Now that you have some traffic to the page is anyone signing up? Step Three: Validate your idea is good enough that people will give you their email address. Get at least 100 visits from a variety of sources, what is your conversion percentage? If you get no signups use Five Second Test to flesh out any egregious problems with your landing page. If you didn’t get any signups then pat yourself on the back for saving an enormous amount of time and resources on faulty content. You only wrote one sentence, talk about failing efficiently. Start over and test a new idea. A good rate for having your emails opened is about 20%-30% although it’s very possible to get higher percentages particularly with this method where users are being pre-qualified for interest. Leverage already successful designs; remember the point is to be efficient with your time. Use beautiful high resolution images to get a beautiful result with the least amount of work. Shutterstock has a great library of stock images to use. I’m a noob. It seems that some of the EXAMPLES OF SUCCESSFUL SQUEEZE PAGES are domains that just exist to point to another domain? http://cloudniche.com/ definitely seems that way. I was expecting the squeeze page to exist as a page on the domain of the microsite. Hi Brian, what’s wrong with that? Two birds one stone is even better no? I love that example because Glenn claims a 64% conversion rate and I believe it (I signed up first time I saw it and I’m a pretty tough sell). Hi Chris! I’m just trying to figure out where the aforementioned example sites locate their squeeze pages. I was caught off guard to see a stand alone domain used solely as a squeeze page for a different domain. Personally I think it’s a super idea, and a beautiful page. However, I wasn’t sure if G would like it or not. p.s. Thanks for sharing your knowledge. You’re absolutely right Brian this can cause problems, Adwords in particular has a policy against “doorway pages” to other domains. In my experience however there is a big distinction between sites that exist for the benefit of the user and that are being manipulative in some manner. Code year even ranks #2 behind it’s parent site for “learn to code” (YMMV). I had a client speak to their Google rep (the above $25k/month kind) once about this very issue and Google OK’d it. I wouldn’t rely on that completely but that’s my experience. If you can create a good user experience I think it’s generally OK.
Nice, Chris. I like the “less is more” point about content. Sometimes we avoid trying something new because the prospect of creating multiple posts a day is overwhelming. I would add that split testing landing pages with tools like unbounce, or visual website optimizer are a great way to finetune your messaging and value prop. I’ll definitely check out LaunchRock! Excellent ideas. We particularly such as the idea of including hyperlinks in order to additional appropriate articles.